Take a Deep Dive into Movement Medicine and Community. 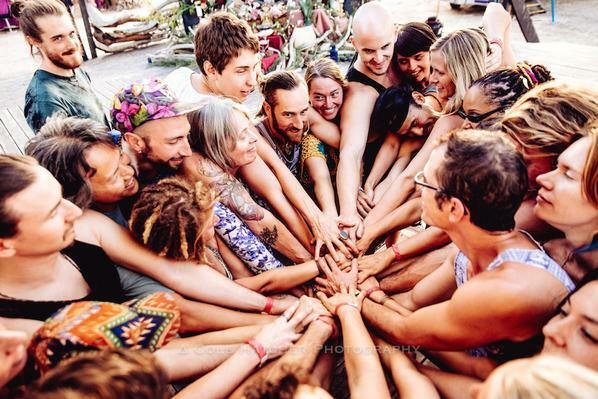 The intention of Convergence is to bring together our varied movement and dance communities for more fun, play, connection, growth, inspiration, and expanding love. All are welcome with an open mind and heart at whatever level of experience or skill. May we learn and grow together for a deeper experience of community. Thursday Arrival and Check-in between 3-5. Programming is planned from Thursday evening through Sunday evening. You are welcome to stay until Monday morning but need to be off the grounds by 11am Monday morning. Please no coming and going. Additional Schedule details TBA and subject to change. Food is NOT included in the price of the ticket. You can pre-purchase a vegetarian meal pass (($62=6 meal tickets.) Organic and delicious meals and food will be lovingly prepared by Chef Martîn. You are encouraged to pre-purchase a meal pass and bring snacks to supplement and nourish yourself over the weekend. If you don’t pre-purchase a meal pass, you will be able to buy meals on site for aprox. $12/large vegetarian plate. Beverages and snacks will be available for purchase on site. This gets you 6 meal tickets to use over the weekend. You save aprox. $3/meal by pre-purchasing. Meals lovingly prepared by Chef Martîn. This allows you to drive your vehicle on-site and camp next to it. Without this pass you will park at the entrance of the venue and carry your camping gear to your camp site. There is a limited amount of these available so don't hesitate. If you are coming with an RV or other large vehicle you will need this pass to park it in the RV camping area. Sleep in a bell tent! All ready and set-up with mattress, bedside table and solar lighting. You provide your own bedding. Simple, but nicer then setting up your tent!